BUY ANY CAR OF YOUR CHOICE — ACCIDENT FREE — AND GET IT SHIPPED TO NIGERIA IN 30 DAYS. ➡️Are you among those persons who think that, buying cars from Nigeria is just like purchasing toys instead of the real thing? ➡️Have you observed that, most trusted cars are the ones from overseas; but you don't know the platform to handle the shipping? ➡️Are you scared, because you might be liable to getting involved in accidents, if you purchase cars here in Nigeria? ➡️Have you tried other platforms, but end up loosing your money and not seeing the car, too? ➡️Has buying car(s) from the United States been among the list of your dreams? WORRY no more, because RILEMAL has got you covered. Want to know about RILEMAL? 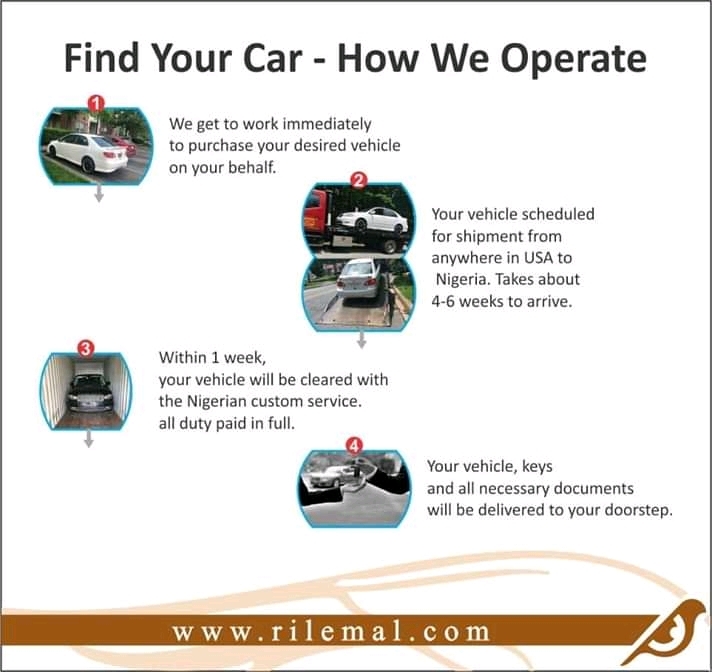 RILEMAL is a brand, which takes care of the shipping of cars to your respective destinations. And, not just that, this brand helps in paying for your SEVIS fee. 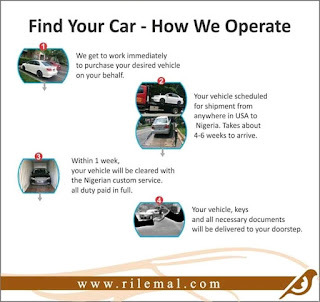 Before you answer that, follow us as we disclose to you the benefits of sticking with RILEMAL. Let's assume a Benz costs N100 (100%), all you have to pay for the Benz is N65 (65%), the remaining N35 (65%) goes for custom Fee. This means, you won't have to pay even a Kobo added to the N100 (100%). The payment options are programmed in such a way that, the least person can make use of them. Options such as MasterCard, Visa, Versa and Bitcoin — in order to enhance swift payment for people from other countries within Africa. Your desired car is delivered to you at your door step. You don't have to spend any further money for transporting yourself to their office. They give you a duration of 6-8 weeks to raise the remaining 35% (Custom Fee) of the money. These cars from the United States are Accident-free, so you don't have to bother about anything. You don't have to worry about the Nigerian custom service, because after the remaining 35% has been paid, your vehicle will be cleared with the Nigerian custom service within a week. And also, you can pay your SEVIS — Student Exchange Visitor Information System — fee through RILEMAL. Who wouldn't feel delighted after paying 65% for any car of his/her choice? Who? You pay the remaining 35% (custom fee), when the car has already reached Nigeria. And, it takes just 4-6 weeks to have your car delivered to you. Another good news is: these cars won't stress you one bit, they won't cause you to visit the mechanic shop every week. Isn't that awesome? No doubt, you can answer this question now. They give you a duration of 6-8 weeks to raise the remaining 35% of the money. - We get to work immediately to purchase your desired vehicle on your behalf. 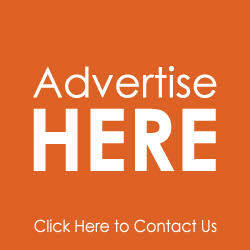 - Your vehicle scheduled for shipping from anywhere in United States of America to Nigeria. Takes about 4-6weeks to arrive. - Within 1 week, you vehicle will be cleared with the Nigerian custom service. All duty paid in Full. - Your vehicle, keys, and all necessary documents will be delivered to your door step. It makes completely no SENSE, spending most your time in a Mechanic shop instead of spending it on the ROAD. RILEMAL SERVICES, after considering these, have put together a very responsive platform to ease you of the stress you are likely to experience in the future. Is it their payment method? It's mouthwatering. What are you waiting for, hurry now to Rilemal.com to get the full details. 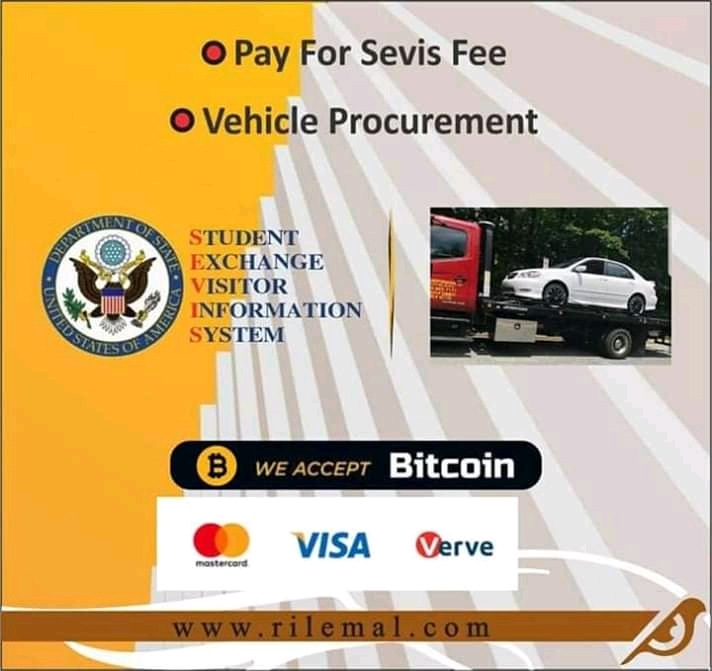 Still wondering why you should opt-in for the services of Rilemal? Just remember that: a vehicle, which functions very well, is always seen on the ROAD; a bad vehicle with good interior is always found in a Mechanic shop, and it's just for taking Instagram pictures.